This book bridges the fields of Children’s Literature and Italian Studies by examining how turn-of-the-century children’s books forged a unified national identity for the new Italian State. Through contextualized close readings of a wide range of texts, Truglio shows how the 19th-century concept of recapitulation, which held that ontogeny (the individual’s development) repeats phylogeny (the evolution of the species), underlies the strategies of this corpus. Italian fairy tales, novels, poems, and short stories imply that the personal development of the child corresponds to and hence naturalizes the modernizing development of the nation. In the context of Italy’s uneven and ambivalent modernization, these narrative trajectories are enabled by a developmental melancholia. 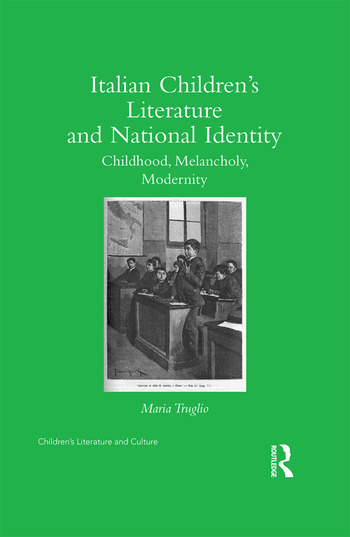 Using a psychoanalytic lens, and in dialogue with recent Anglophone Children’s Literature criticism, this study proposes that national identity was constructed via a process of renouncing and incorporating paternal and maternal figures, rendered as compulsory steps into maturity and modernity. With chapters on the heroic figure of Garibaldi, the Orientalized depiction of the South, and the role of girls in formation narratives, this book discloses how melancholic itineraries produced gendered national subjects. This study engages both well-known Italian texts, such as Collodi’s The Adventures of Pinocchio and De Amicis’ Heart, and books that have fallen into obscurity by authors such as Baccini, Treves, Gianelli, and Nuccio. Its approach and corpus shed light on questions being examined by Italianists, Children’s Literature scholars, and social and cultural historians with an interest in national identity formation. Maria Truglio is Associate Professor of Italian and Women’s Studies at Pennsylvania State University, USA.